The Select PPE (Pty) Ltd issuing system manage and control the issuing of PPE to workers of various industries. This standalone PPE issuing system stores the client’s issuing data in locally saved segregated SQL databases. As the leader in the field, and with the input of various clients, the system was developed and improved since the beginning of Select PPE in 1998. It started off with a manual paper card system which was soon followed with the first computerised system build as a Microsoft Access database application before it was eventually converted into a unique VB.net developed desktop application. The needs and requirements of various clients were taken into consideration as the application was developed over the last few years. This system enables companies to comply with industry and regulatory requirements. 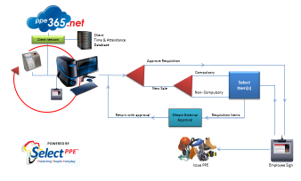 Employers can use this system and configure a uniquely customised Issuing Protocol (IP) which stipulates the rules under which it will supply PPE to them. This IP allows the customer to determine the specific PPE needs for each employee in line with their specific job requirements. The system is available online and can be accessed from anywhere, so even if you have multiple sites in various locations, clients will now have a centralised view of all their PPE issued without the worry of abuse or that their workers do not comply to the required predefined PPE standards or IP. The Online Application is hosted in a secure datacenter managed and continuously improved by the dedicated IT team of Select PPE (Pty) Ltd. All improvements are beneficial to all Select PPE clients who do not need to worry about server hardware or maintenance costs.